I have always been a fan of permeable driveways (except in my younger skateboarding days). They allow for absorption of runoff, recharging aquifers, and naturally filters the water before it reaches ocean, lake and river outfalls, improving water quality. It reduces the dangers from flooding and the need for huge storm drains and channels. Additionally, it can help with the ‘heat island’ effect where the heat of the sun is stored in all of the concrete and asphalt of urban areas, thereby trapping the heat and altering the micro-climate of the area. There are several methods out there from just using a permeable porous concrete type mix if you prefer a solid looking surface, to a brick style where water can run through the cracks, a basic gravel, or just go all the way and create a green live driveway of grass, turf or native plants. The really easy (and somewhat common) way to create a green driveway is to plant an area and provide a solid surface (such as bricks or concrete strips) for the tires only. No matter what style suits you, there is a greener driveway option out there. Professionals are out there who can help you plan and execute your eco friendly driveway, or you can just do it yourself (DIY). Lets start with the variations on what is available in the way of environmentally friendly driveways. Porous pavement is a permeable pavement surface which contains a reservoir underneath. The reservoir holds the surface runoff, allowing it to slowly infiltrate into the subsoil. This allows the water to receive some natural filtration treatment. Porous pavement can mimic traditional asphalt or concrete but is manufactured without the fine, dense materials and incorporates hollow spaces that allow for water infiltration. This is not the greenest option, but is a great alternative to a traditional concrete or asphalt driveway. Because of many homeowner association rules and aesthetic considerations, this may be the best option for you. To make it even better, you can make it a green driveway by adding grass or some type of low growing hearty foliage to help with the absorption of runoff and automobile leaks. There is a great tutorial of a DIY green driveway on frankejames.com where the homeowner actually did all the work themselves, and there are commercially available products from sources such as Invisible Structures. Most living driveways incorporate several layers, starting with a compacted sandy surface to maintain grade, followed by a sandy loam filled support structure (commonly a plastic honeycomb grid) to support the root system and maintain the solid surface to drive on. Steep slopes can cause issues if you choose an open-cell driveway with gravel fill. Gravel can come loose and cause unsafe conditions for automotive traction. For hilly driveway applications, using porous pavement, or gapped porous pavers may be a better option. For most climates, late spring or early summer will provide you with the best weather to install new your new driveway, whether professional or DIY. This will avoid excessive rain, snow, or other inclement weather that may interfere with the installation. If you own or know of companies with green driveways, please leave a comment below for our readers. Has any family/individual done it in the area yet?? I’ve been working with people (home owners / landscapers)in Canada and the US to build green driveways using EcoGrid – which is 100% recycled plastic. It gets used a lot in LEED Certification. Its fantastic for parking pads: it looks like grass and stops mud and ruts. 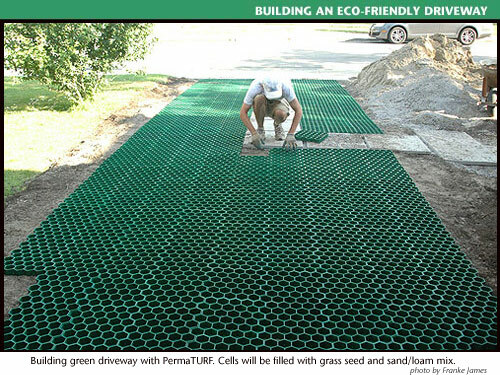 The Ecogrid is much less expensive than the concrete pavers (photo 2). Porous asphalt is difficult and expensive to install. Repairing it can be very difficult. What a great idea! This is such an easy, affordable tool that can help make our world a little bit more green. In japan, many places already do this. they set up their parking lots like this, with grass and brick patchwork. Fiberglass grating is a similar product that comes in 4’x12′ sheets. Since it is glass fiber reinforced, it is much stronger than a standard plastic grid. It also comes with a grit surface that is molded into the top for slip resistance. We’ve done sidewalks like this, filling in the voids with pea gravel. 20 years later, it looks brand new. How does it do in the North where i have to snowplow my driveway to get out of my garage. I have the widest driveway on my pleasant street and I would like it to be aesthetically pleasing as well as taking care of the run off but people tell me I can’t do it. From what I have heard, they do great in colder, snowy climates since the roots are protected within the honeycomb structure below ground. It would depend on the way you clear the snow from the driveway. The fiberglass or plastic honeycomb works great for shovels or light impact snow clearing devices. If it will contact or bang up against the driveway, you may want to use the concrete systems to prevent wear. I would consult one of the green driveway contractors for their recommendations- they would be the best to know. A follow up on Margaret’s question: If I install a twin track, how do I keep the center area clear of snow–or enough to use the driveway. I am in a moderate snow area, only about 48 inches a year, but some storms will dump a foot or so. I know it is far from eco-friendly, but does a 2 stage snow blower work over grass or gravel? Where could I purchase the fiberglass grating that you mention? We live in central NY (very snowy and cold) and I am concerned about how well the plastic grating will stand up to our climate. For a sleek finish driveway, try resin based surfacing that is porous so allows water to soak through, reducing the risk of flooding, and it can be made from recycled materials such as crushed CD’s. I have only one concern with this, especially since these versions are so much pretty than traditional concrete or asphalt. What if you get an oil leak in your car? The oil could go into the groundwater. No matter what surface a driveway is, any oil leaked, will get into the groundwater. Grass, dirt, asphalt, pavers, concrete. They all allow oil drips to permeate into the ground. Actually, that is the great thing about these types of driveways, instead of oil dripping onto concrete and then washing off into stormdrains, it is filtered through the soil. Unless you are directly ontop of an aquafir or ground well, it is more beneficial to have these tiny amounts of oil broken down and filtered through the soil and plants. Has anyone done this in the Northeast? I live on Cape Cod and have a gravel driveway. It is say 20′ wide x 40′ long (with a moderate incline – 10″ per 10′) with a 30’x30′ platform in front of my garage. I’d like a complete green dievway. How can I get started? Sounds like you are doing better than most! The gravel allows the water to penetrate around it and reduces runoff, so you are already pretty ‘green’! I have seen it done in the Northeast, Canada, and pretty much everywhere. I guess your concerns come from the winter, specifically snow. If you use the grid system, the roots of whatever you decide to plant stay protected below the actual grid, so even when you plow or shovel, you can expect the ground cover to come back in the spring. To get started I would suggest contacting a provider in your area or try and go DIY using the tutorial here if you like! Good luck Andy, and feel free to share your experiences here! This is a far more sustainable way of creating a driveway or pavement. I recently purchased some similar grids from Gridforce (www.gridforce.co.uk). Installation was easy, it looks great plus it’s a lot better for the environment than more traditional driveways. Where can I find that product that you use for my driveway. I am posting many years later, but in case someone has an answer- I wonder if the grid system would still permit my young children to ride their bicycles on. Thank you for your response in advance! It depends on what type of grid system you choose (there are now several on the market), but generally, it will depend on if you plant a grass or groundcover or plan to just use a gravel surface. They do maintain a firmness, so bicycle tires should have no problem rolling on top of whatever you use. We need to create a parking pad adjacent to a wheelchair ramp. Is there any reason to believe that a wheelchair could maneuver safely on this surface? It really depends on the surface you choose. I’m sure there are several eco-friendly options that allow water penetration while still providing the stability needed for a wheelchair. I’ve covered a few eco-friendly surface options in this post, you can contact the manufacturers for additional information. Long term parking on grass means you have to deal with rust issues caused by nitrogen gas rising up from the grass under your car. I thought plants took up nitrogen. Nitrogen causes rust?? Not in my universe. You need oxygen to make rust. I can imagine humidity from the grass increasing rust, thanks to the oxygen contained in water, but not nitrogen. Nitrous oxides, maybe, but never plain old, oxygen-free N2. Unless grassy soil emits nitrous oxides? I would guess it does not, but I do not know that for certain.